rif and I were in Penang during the Merdeka weekend. As I’ve blogged about my Penang trip not too long ago, I’ll only be blogging about the new places we’ve been to. 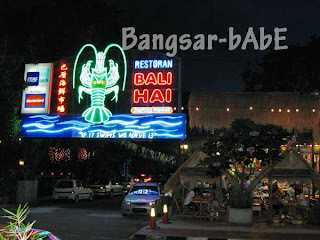 Since I’ve read some pretty good reviews on Bali Hai, we (rif’s family) decided to have dinner there. There were many patrons that night, with quite a number of them being foreigners. We ordered the chiew pai tofu, siong tong yuen choy, Marmite chicken, salt and pepper squid, kam hiong lala, steamed fish and salted egg crabs. The chiew pai tofu was quite nice. 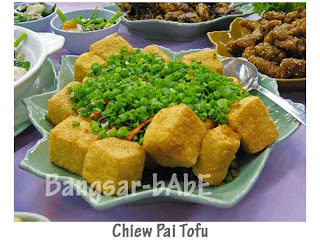 Topped with chopped spring onions, the tofu was deep-fried till golden brown with crispy edges. 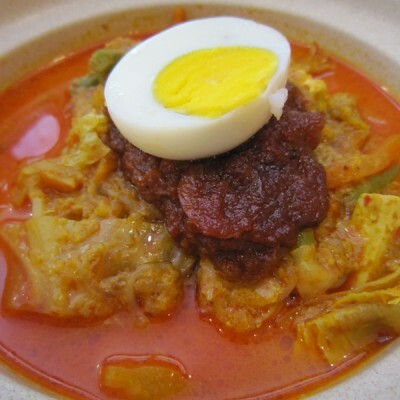 Beneath the crispy exterior was the soft egg tofu with texture that glides down the throat. 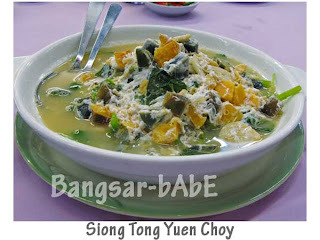 We all enjoyed the spinach in superior stock (siong tong yuen choy) very much. 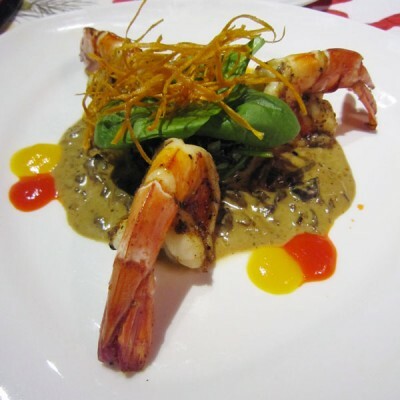 The spinach was cooked with three types of egg – chicken eggs, salted duck eggs and century eggs, resulting in a delicious marriage of flavours. The Marmite chicken was alright. Then again, it’s hard to go wrong with fried chicken. 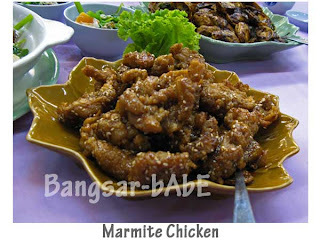 The chicken was tender and coated with savoury yet sweet Marmite sauce. Palatable, but nothing spectacular. 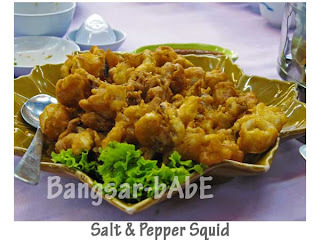 The salt and pepper squid was very tasty. The batter had bits of black pepper and was crispy and light at the same time. The squid rings were cooked just right and very springy. It tasted best when dipped in the chili sauce provided. *If only there was beer…* The kam hiong lala was fragrant and packed quite a kick. The thick, dark gravy was spicy with plenty of chopped bird’s eye chili. Though the lalas weren’t that big, they were rather plump and juicy. The steamed fish was quite fresh (or at least fresh enough not to have that “muddy” smell). 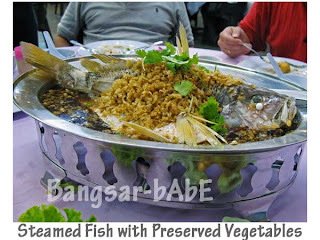 The preserved vegetables gave a salty, tangy flavour that enhanced the sweet flesh of the fish. The salted egg crabs were absolutely divine. Coated GENEROUSLY (read: cholesterol) in rich and creamy salted egg mixture, the crabs were fresh, succulent and decent in size. 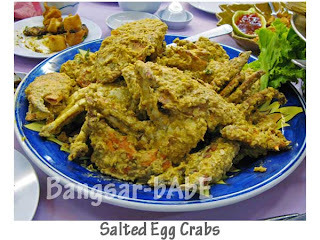 One of the best salted egg crabs I’ve tasted and I enjoyed every morsel of it. All in, dinner was quite good. Service was a tad slow, probably because it was a full house that night. Not sure how much exactly the bill was (rif’s father paid), But I think it was around RM200 for the 8 of us. 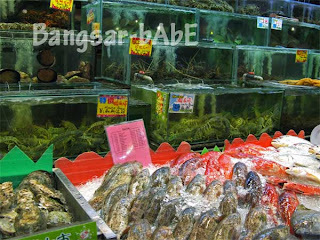 Very reasonable for good and fresh seafood. Verdict: Drop by for good seafood. 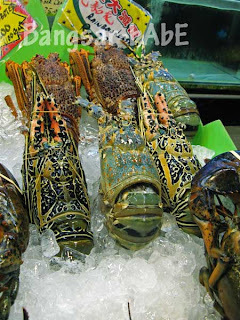 Try the crabs, fried squid and spinach in superior stock. Prices are pretty reasonable, unless of course you order their Alaskan crabs or lobsters. haha i had to glance every hard to find any hint of crab..note DAMN ALOT of salted eggs! !